Archaeologists and historians have long been perplexed over the great stone monuments left in ancient ruins all over the Earth. Modern builders with even their finest tools still cannot cut, move and fit stones as large as 10 tons and put them together with the amazing precision found in great temple ruins. That includes the Great Pyramid at Giza, the various pyramids found in South America and the three massive cut stones comprising the Baalbeck Trilithon in Lebanon, said to be the largest cut stone blocks found anywhere in the world. Their weight is estimated from 750 to over 1,000 tons. Anthropologist Sasha Alex Lessin, has published an interpretation of the historical record allegedly left by Lord Enki, the leader of the Anunnaki, alien entities that came to Earth to mine gold. Lessin claims the aliens used their knowledge of DNA to create modern humans from primitive humanoids, and established great cities, road systems and landing strips all over the planet. They also were known as the Niberians. This record was left on thousands of clay tablets found in the area of Samaria. Some say they date back about 6,000 years. What is interesting about the stories found on the tablets is that . . . if they can be believed. . . help explain some of the great archaeological mysteries of the ancient past. The tablet stories explain how their Chief Nibiran Aarchiect Ningishzidda "planned and built the gigantic astro-navigation andmark pyramid and Sphinx at Giza. Niberians made spaceports at Sippar, then on the Sinai Peninsula and the Nazca Plateau in Peru. The text states that: "Ningishzidda directed Lagash's King Gudea who built a temple for Ninurta. Niberians used their know-how and Earthling labor to build rocket silos and airplane hangers in the cities and temple-complexes of Sumer." 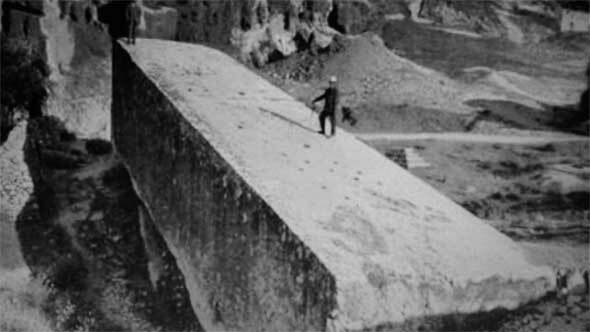 It explains how the Niberians "cut stones as large as 10 tons with huge cutting tools run on power pulled from the earth and capacitance and amplified by crystals that broadcast energy within pyramids such as the Great Pyramid and Giza and Enki's Pyramids in South America. They used white powder of mono-atomic gold to lighten iron-laden, magnetically charged stones for transport to construction sites." It is interesting to notice that the text suggests that the Anunnaki were not the only visitors from the stars on Earth at that ancient time. The text tells how the Anunnaki and "other extraterrestrials and then the ancestors of humanity on every continent built megalithic -- big rock -- sites on Earth's ley lines -- oscillating telepathic internet fields where all who worship fuse their consciousness into one group mind and can communicate with people and their knowledge at other megalithic sites." The Lessin report, drawn from his study of the tablet record, goes on to explain that "giant tell-uric (mind-harmonizing telepathic) waves,undulating vertically and linked to the geomagnetic field of Earth, create a network of crisscrossing lines all around the planet." This appears to explain why the ancient stone works are found following the known ley lines through Europe, the Americas and other parts of the world. The ancient builders marked the crossing points with standing stones, Lessin wrote. He said the elongated shapes -- mehir, church steeples and other structures acted as antennae, attracting "cosmo tell-uric waves" that flow through a worldwide network. There was a spiritual side to all of this amazing construction work. Lessin suggests that tapping into the ley lines allowed the alien visitors to gather ancient knowledge and that the sites triggered "a shift to a heightened and more spiritual state of consciousness." He wrote that: "though the ET's chose the sites, our ancestors in every era and on every land anchored them with stones and buildings. Once fixed, our forefathers reinforced the broadcasting power when they prayed at the sites." He said they experienced a "planetary consciousness" when they did certain rituals at the large stone sites.